As students munch on chips and sip Topo Chico in a room at the University of Texas’s Jewish student center Hillel, conversation turns to heritage. One student says that his family fled to Puerto Rico during the Spanish Inquisition. Another talks about how her family went to Mexico during the Holocaust. Some of these students have Jewish backgrounds, and some have Latino ones — many have both. They are part of the Latino-Jewish Student Coalition, a group of students who come together to share customs and discuss how to instigate social and political change like immigration reform and pro-Israel legislation. Hoping to spread the coalition to college campuses throughout the country, coalition members Tracy Frydberg and Elizabeth Anderson made a documentary called “Project Puente,” which will premiere Monday, Feb. 23 at the Blanton Museum. Screenshot from the film "Project Puente," produced by Latino-Jewish Student Coalition members Tracy Frydberg and Elizabeth Anderson. The film premieres Monday, Feb. 23 at the Blanton Museum. 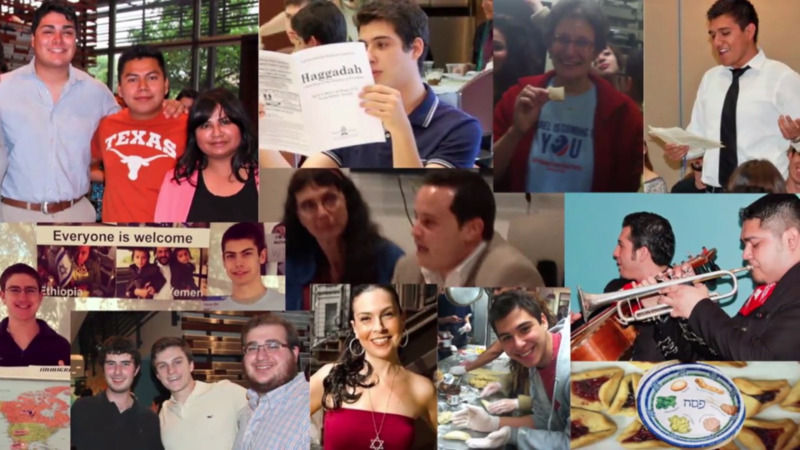 To film “Project Puente,” Frydberg and Anderson traveled to Monterrey, Mexico City, Buenos Aires, Washington, D.C., San Antonio and Austin to tell the story of the relationship between Latino and Jewish communities. The documentary also delves into the history of the relationship between Latino and Jewish communities, which began with the expulsion of Spain’s Jewish population in 1492. Members of the Latino-Jewish Student Coalition want to share traditions and use the coalition as a platform to learn about issues important to people different from themselves. The coalition’s biggest event of the year is the Freedom Seder, which combines the customs of Passover, an eight-day Jewish holiday in March or April, with Latino issues, such as immigration reform and the DREAM Act.